Inspired by a real-live almost filibuster (Bernie Sanders, December 10, 2010), David and I sat down to watch Mr. Smith Goes to Washington. 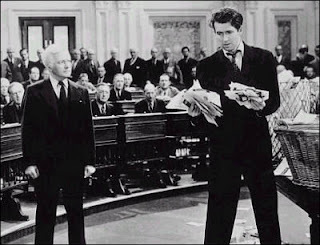 Jessica: So, what do you like about filibusters? David: Well, I don't like faux filibusters, where it is used a procedural measure to block a vote without anyone actually having to get up and talk. Now a real filibuster, where one person or a group of people engage in a marathon of talking to draw attention to an issue they see as important, that has some appeal. As the announcer in Mr Smith says, free speech at its finest. That's kind of cool. Jessica: What do you like about Mr. Smith Goes to Washington? David: It's the classic David and Goliath story. An everyman against a political machine. And we all know Jimmy Stewart is great at playing the everyman. Also, it appeals to the vision of America as a country of ideas where the pen really is mightier than the sword or the pocket book. Jessica: Tell us a little about Mr. Smith's cause. David: Jefferson Smith is the head of the boy rangers, an organization clearly based upon the boy scouts. He would like to build a national boys' camp in his home state to be payed for in nickels and pennies sent in by boys all over the country. Unfortunately for Mr. Smith, the site where he would like to build the boys' camp is also the site of a proposed dam. The construction of this dam has been snuck into a bill by Jeff's fellow senator as graft. This of course means that Jeff starts asking inconvenient questions. Jessica: What is your favorite part of Mr. Smith's filibuster? David: When the page brings him a note from Saunders (Jean Arthur). I'm a sap. Just wait for it. Jessica: May we watch many more political movies together. David: I suggest The American President, although it's not a classic by the terms of this blog. Four stars... would watch again. Labels: carrier pigeons, Claude Rains, Frank Capra, James Stewart, Jean Arthur, Jimmy Stewart, national monument, politics, soft focus, Washington D.C. I love this movie! But of course, it's impossible to not love a movie when it's Capra and Stewart. The cynic in me immediately turns into an idealist the moment I start watching this movie.